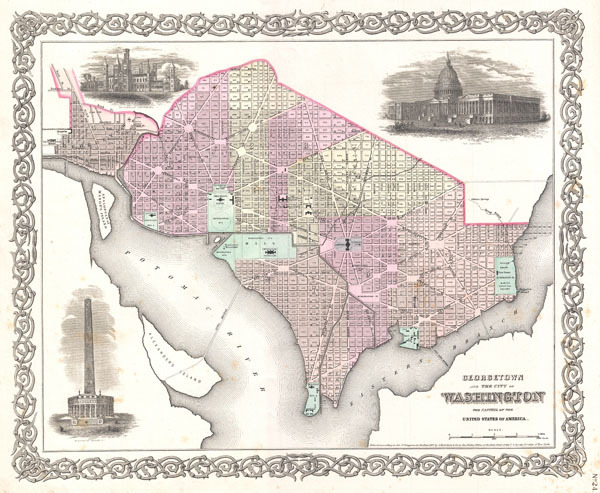 1855 Colton Plan or Map of Washington D.C.
An excellent 1855 first edition example of Colton's rare map of Washington D.C. and Georgetown. Covers the city in incredible detail from Georgetown (Georgetown University, then College, shown) in the upper left quadrant to Alexander's Island in the south and as far east as Magazine Warf. Hand colored in pink, green, yellow and blue pastels with considerable detail at level of individual streets and buildings. Surrounded by Colton's typical spiral motif border. Reflects Pierre L'Enfant's brilliant city design, showing the iconic grid and ray street layout. Individual buildings such as the Smithsonian, the White House, the Capitol, the Arsenal, Penitentiary, Naval Yard, Poor House, Asylum, and Post office are all indicated. Features three inset engravings: The Smithsonian Institution, the Capitol, and a preliminary plan for the Washington Monument. Dated and copyrighted to J. H. Colton, 1855. Published as page no. 24 in volume 1 of the first edition of George Washington Colton's 1855 Atlas of the World. Rumsey 0149.030 (1856 edition). Phillips (Atlases) 816.